Here are a few poses to open the hips. These poses can be held for 3-5 mins as a Yin Yoga Poses, finding meditation in each pose, strong but gentle breath. The Dragon Poses, Swans, and Square are deep openers for the external rotation of the hip socket. Shoelace will be a nice counter pose for this. Other counter poses would be Child’s Pose, Down Dog, All fours hip circles. Be intuitive with what your body needs. CAUTION: Please take care with this poses, use blocks/ cushions to support your body. Never force into a pose. Remember everyone’s pose will look different Yoga is not a competition. Always be able to breath fluidly. Strong deep inhale & Slow and full exhale. Enjoy. Email me for any questions or for further instruction. Square Pose – ankle staked on knee/ knee stacked on ankle. If the first knee is very high in the air, you are not ready for this variation! Square Folding forward – stretches the lower back and can intensify the stress in the hips. If you can’t come forward, sit on a cushion. Square completely forward – deeply stretches the back on the side hips. Great for Moon Cycle Practice. 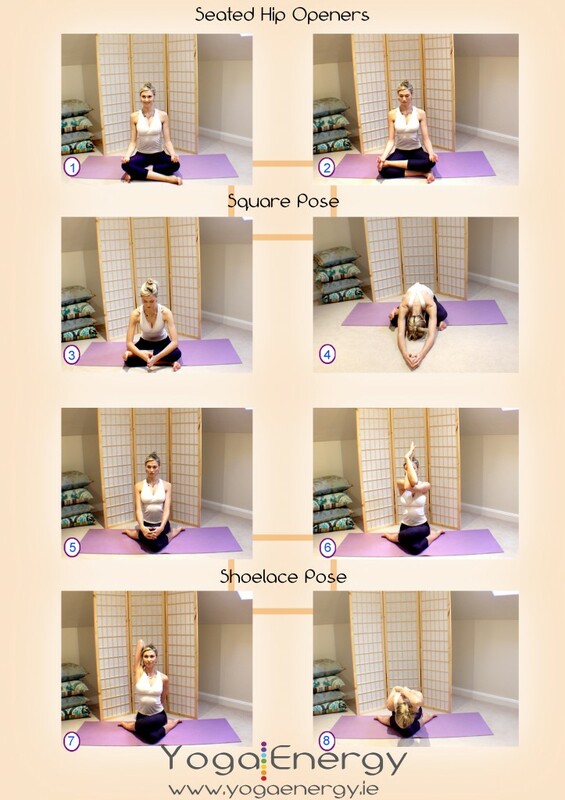 Shoelace pose – there are several options for coming into this pose. One way is to begin by kneeling on all fours then place one knee behind the other and sit back between the heels. Try not to sit on the feet but slide them as far forward as they can go. Grounding both sit bones to the mat. Shoelace with eagle arms – if starting with right leg on top then start with right elbow over the left, try to get back of hands together or palms together full twisted version. Shoelace with Shoulder Stretch – right leg on top, right elbow up and stretch shoulder joint. Shoelace forward bend – Try this with shoulder stretch if too tight you can just fold forward using hands to support you. Dragon Pose – begin either in Down Dog. Step one foot between the hands. Check the knee is right above the heel. Slide the back knee backward as far as you can. Keep the hands on either side of the front foot. Any pinching sensation bring hips back a notch. Low Flying Dragon – lower to elbows, you can lower onto blocks if you want. This is an advanced option. Try it but if the body tenses up go back to hands. You are looking for the body to be soft and relaxed, not muscle tension. Let the Breath invite you into the pose. Twisted Dragon – Turning the toe out the the side ( Right toes to 2 o’clock or Left toes at 10 o’clock) come on to the side of your foot. Let the knee hand out- deep groin stretch. Use your hand to gently open the hip further. Flying Dragon – Leg the same as about. Take the arm back to open into the chest and shoulder. Flying Dragon – Taking hold of the back foot, allow the hips to hand and the body to bow. Beautiful whole body stretch. Swan Pose – come into this pose from Down Dog. Slide your right knee behind your right wrist and check in with how your right knee is going to feel. If the knee is fine, flex the right foot and move it forward; shin diagonal or (more advanced) parallel to the top of the mat. If the knee feels stressed, bring the foot closer in toward the right hip. Now, centre yourself so your weight is even. Both hip bones pointing forward. Try tucking the back toes under and sliding the back knee away. Do this a few times until your right buttock is on the floor or as low as it is going to get. ( use a block under the thigh or buttock to modify. Sleeping Swan – Gently walk your hands forward, come to your elbows. take a few breaths there. If you are ready to fully fold forward then rest your head on our hands or a pillow, allow arms to completely relax. Remember: no tension- relax all muscles and allow body to hang. To come out: Ease the hands back under you for support and left the body up, tick the back toes for support and rest in childs pose or flow to next pose. Alternate Leg Stretch – Feel the stretch in the back of the leg, you can use blocks under your hands if you cannot reach down and forward. Lift toes to add a deeper element. Modified Monkey Pose – Ease the front heel forward from an Alt Leg Stretch, use blocks to support under the thigh if needed. DOn’t push into the pose. Gently ease into it. Take a few breaths at each version to keep remindeing hte body to realx. Monkey Pose – Hanumanasana/Dragon Splits/ offers the deepest stretch for hip flexors. Straighten both legs into the splits. Support the front hip with a bolster under the buttock/thigh for balance and to release weight; this relaxes the muscles. Sit up tall. Raise hands over head in prayer, or hands at heart centre. Sleeping Monkey – fold forward for different sensations ( Intense) do with Caution!